Thieves essential oil is not one oil. It’s actually a blend of a number of essential oils that, when combined, could provide a number of benefits to your body and overall health. Included in this mixture are rosemary, clove, eucalyptus, lemon, and cinnamon bark oils, with the mixture itself supposedly created during the “Black Plague” to help thieves stave off the illness as they robbed the homes of the sick and the dead. But, are Thieves essential oil mixtures worth trying? What are the purported Thieves essential oil benefits? In this article, we’ll look at not only the benefits of Thieves essential oil, but also Thieves essential oil uses. By the time you are done reading this, you should know whether Thieves essential oil is right for you and your health issues. Given the backstory of the concoction, you may be wondering how to use Thieves essential oil. There isn’t much demand for a product to deter the bubonic plague these days. As it turns out, Thieves essential oil has many uses. But let’s start off with the basics. You first need to put your mixture together. If this seems too complicated, or if you are unsure, there are pre-made Thieves essential oil mixtures likely available at the same place where you buy your essential oil. But, if you want to try and mix it yourself, here’s a basic recipe. Thieves essential oil is used for many skin issues due to its anti-inflammatory properties (especially those of the clove and lemon oils) as well as its antibacterial traits (eucalyptus and rosemary oils). In this case, using Thieves essential oil could not only work to clean out what may be causing the acne and dirt and debris that may be clogging pores, but it could also help prevent bacteria from returning and any infections that might try to take up residence. One of the biggest issues that you may have with a cold, flu, or sinus congestion is difficulty with breathing. With its mix of anti-inflammatory, antiviral, and antibacterial properties, Thieves essential oil may help relieve this congestion in a really simple way. Just put a few drops in your humidifier before bed and breathe in the vapors. This can also be done by placing a few drops in a pot of boiling water, covering your head with a towel, (make sort of a tent or seal with the pot) and breathing in the vapors that way. Due to its numerous anti-inflammatory properties, Thieves essential oil could help with muscle and joint pain in the simplest of ways. Take a few drops and rub them into your hands to warm up the oil. Massage the remedy into the muscle or joint that’s giving you some trouble. The anti-inflammatory properties of the oil might also help reduce the swelling in the throat, the antibacterial properties could help get rid of what’s causing the sore throat, and the antiseptic qualities of the clove oil may help soothe the throat. Take a glass of warm water and stir in two or three drops of Thieves essential oil. Gargle the mixture for a minute or two and spit out. Do this at least twice a day for best results. Mix 10 ounces of water with 20 drops of Thieves essential oil. Pour the mixture into a 10-oz. spray bottle. Use on kitchen counter tops, stove tops, bathroom sinks, and the like. Before each use, shake up the bottle to mix the components again. Thieves oil can be used as part of a homemade toothpaste. Mix two drops of Thieves essential oil with four tablespoons of baking soda in a glass container. The baking soda provides enough grit and substance to remove food, debris, and other things from your teeth, while the oil acts as a cleaning agent as well as fights any bacteria in the mouth (a great way to prevent bad breath and other more serious mouth issues). While a large amount of scientific research has yet to confirm the effectiveness of Thieves essential oil as a whole, each of the oils in the Thieves essential oil mixture has been used for centuries for various health benefits. 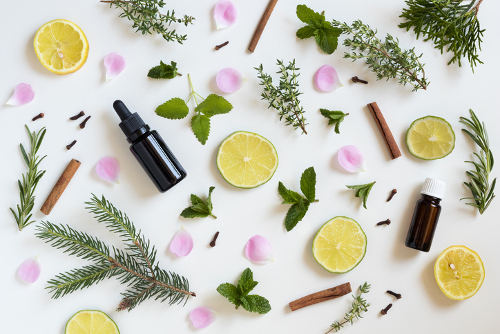 As we’ve noted above, the mixture of Thieves essential oil, in particular, may be able to help you with a variety of body concerns, from skin care and weight loss to more internal benefits like bone and respiratory health. Thieves essential oil can even be used as a house cleaning product. Rosemary oil has been studied for its antibacterial properties, which may make it effective for treating infections caused by E. coli and Enterococcus faecalis bacteria. Researchers found that compounds pinene and cineole could penetrate the bacteria’s cellular membranes in a 2013 study published in the Food Control journal. Another of the mixture’s powerful components, clove essential oil, contains a chemical compound called eugenol, which at least one study suggests could provide protection against liver disease. Small amounts of the oil may also reverse inflammation and the oxidation of cells, according to a 2014 study published in the Journal of Immunotoxicology. Lemon oil carries the citrus flavonoids hesperidin and hesperetin, known for antioxidant and anti-inflammatory activity that could potentially fight against free radical damage linked to cancer and heart disease. It may seem too good to be true at first, and to be honest, not every effect will work for every person. But the sheer range of possible health benefits makes it worth exploring. Thieves Essential Oil Isn’t Just for Thieves Anymore! The amusing roots of Thieves essential oil makes the mixture sound a little mysterious and cool, and perhaps it’s just a good story. Yet, at the same time, there is a logic to it that helps us today. The idea that combining these multiple remedies to prevent the infection of one of the deadliest bacterial outbreaks in history has now lead us to one multipurpose oil mixture that could fight several ailments and clean your home makes it great in some ways. It may not be your cup of tea for treating a sore throat or a muscle ache, but you may love it as a counter cleaner. Maybe you don’t like it as toothpaste, but it might be just what you need for a head cold. These multiple uses make Thieves essential oil a steal … so to speak. Gremont, L., “10 Uses for Thieves Essential Oil,” Homemade Mommy, January 30, 2014; https://www.homemademommy.net/2014/01/uses-thieves-essential-oil.html, last accessed July 19, 2017. “9 Impressive Thieves Essential Oil Benefits & Uses,” Organic Facts; https://www.organicfacts.net/health-benefits/essential-oils/thieves-essential-oil.html, last accessed July 19, 2017. “12 Thieves Essential Oil Benefits & Uses (Plus Recipes & Application Tips),” Essential Oil Sanctuary, December 24, 2016; http://essentialoilsanctuary.com/thieves-essential-oil-benefits-uses/#12_Thieves_Essential_Oils_Uses_for_Your_Health, last accessed July 19, 2017. Ameen, N., Asya Twahir, A., “Thieves Essential Oil: What it is and 40 ways to use Thieves Oil Essential Oil,” Conscious Health, November 21, 2014; http://conscioushealth.net/thieves-essential-oil-what-it-is-and-40-ways-to-use-thieves-oil/, last accessed July 19, 2017. Parhiz, H., “Antioxidant and anti-inflammatory properties of the citrus flavonoids hesperidin and hesperetin: an updated review of their molecular mechanisms and experimental models,” Phytotherapy Research, Mar. 2015; 29(3):323-31; https://www.ncbi.nlm.nih.gov/pubmed/25394264, last accessed July 19, 2017. Ojeda-Sana, A., “New insights into antibacterial and antioxidant activities of rosemary essential oils and their main components,” Food Control, May 2013; 31(1)189-95; http://www.sciencedirect.com/science/article/pii/S0956713512005221, last accessed July 19, 2017.